Our flights were too easy. We didn’t have to wait in line for security, and, on the second leg of the trip, we each had a row to ourselves. But easy flights meant that adventure lay ahead. It started with the signs. As a general rule, road signs in the Czech Republic tell you where the road leads, not what it is called. And as a general rule, Google Maps does the opposite, which meant we explored a little more of the Czech countryside than we’d intended. After 4 hours, mostly on winding roads covered in pea soup fog, we arrived in Jilemnice, a small village near the Krkonose Mountain Range, where we met Fabian, a Czech friend we know from the collegiate ski circuit. Jilemnice is a remarkable destination given our goals. 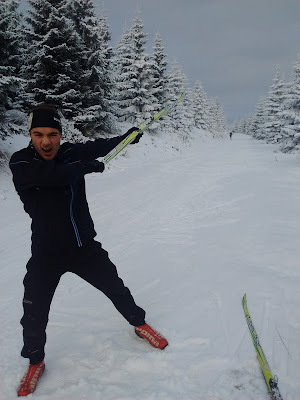 Colloquially known as the cradle of cross country skiing in the Czech Republic, it is home to a nordic ski museum, the oldest nordic ski club in the country, and, when there is snow, connects hundreds of kilometers of skiing. Fabian’s family has been more than generous in hosting us, and has put us up in their flat in Horni Misecky, about a 25 minute drive up into the mountains. Horni Misecky sits on a downhill mountain and is comprised mostly of condos and pubs. It also has the only snow in the Czech Republic right now, a fact we didn’t realize until we arrived. Continuously entombed in clouds (at least since we’ve been here), snow freezes like powdered sugar on the needles of trees, on rocks, and basically everything else. 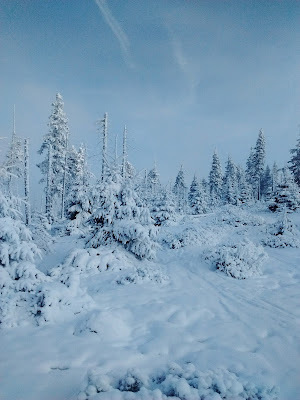 Every day looks dusted with a fresh snowfall, hiding the fact that there is only about 3 centimeters of snow on the ski trails. That is why we’ve skied up the side of the alpine mountain every day. The best ski trail is only accessible via the slopes, so each ski begins with a 15-minute hike up and a rocketing ski down the other side. 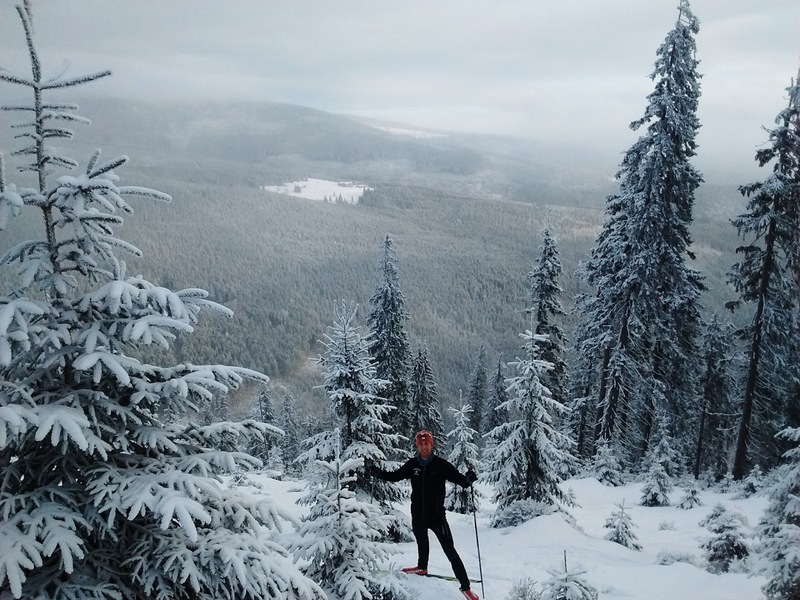 The trail itself, at least for the holidays, was packed with Czech ski clubs who have traveled here to find snow. We’ve skied for a couple of hours every day and explored a couple of connecting backcountry trails. Despite the dearth of snow, we’ve managed some excellent training and seen some of the most striking winterscapes of our lives. Fabian’s family has taken us on several more fun adventures. We went to see Star Wars, which we thought would be in English, but was actually dubbed in Czech. We used the circumstances to tune our ears to some of the Czech words we are learning (ano – yes, ne – no, ahoj (pronounced ahoy) – hey, and maybe a couple more) and Tyler, though he picked up on the major parts of the storyline, can still arguably claim that he has never seen any of the Star Wars movies. We also went bowling with Fabian’s cousins. I teamed up with his two younger cousins, bowled well and our team maintained its bowling integrity, but Tyler and Fabian’s mom and uncle ended up taking home the victory. Afterwards, after a quick downtown tour, we headed to his cousin’s, who have a sauna in their house. They asked us what our preferred sauna temperature was. I said I didn’t want to pass out, Tyler said survival, and we settled on a nearly blood boiling 95˚C. Though the freezing showers following the sauna sessions were intimidating, the overall experience was relaxing, cleansing, and unique. It might have been the perfect end to a fun night if I hadn’t broken a board on the sauna floor stepping down from the top seat. It looks like I need to start losing weight. Jackson watches the Tour de Ski, and it's live! On TV! And he's drinking tea because Czechs drink tea with everything. We are now beginning our final preparations for the Jizerska, which has taken a new direction with the country's absence of snow. 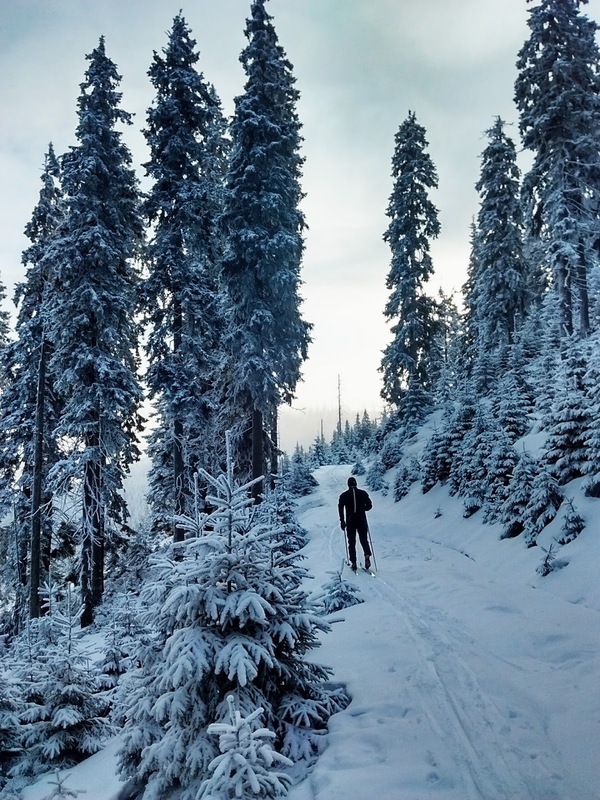 Though for a while race organizers debated making the marathon a running race or a combined running and skiing race, they’ve managed to make and scrape enough snow for a 4 kilometer loop and we get to ski. Since they can’t put 5,000 people on four kilometers, they are running successive 2-hour 16k races with 400 participants in each race. We landed in the last one, from 3:00 – 5:00 on Sunday. Headlamps mandatory. You managed to make it look like there is all kinds of snow - those pics make it seem like you are in a winter wonderland! At least you are getting to ski and don't have to do a running marathon! Though, I imagine that 400 skiers with headlamps on a 4k loop will lend itself to plenty of excitement and the feeling of the type of crowd you will have get used to skiing in men! Good luck!